Go bluewater cruising with British sailor and TV Director, Michael Briant on his circumnavigation aboard his 1980 Moody 36 center cockpit sloop, Bambola. Scroll down for episode descriptions and trailers. Rent or Download-to-Own the Series through Vimeo. everywhere there is a Vimeo App: computer, tablet, smart phone, smart tv. 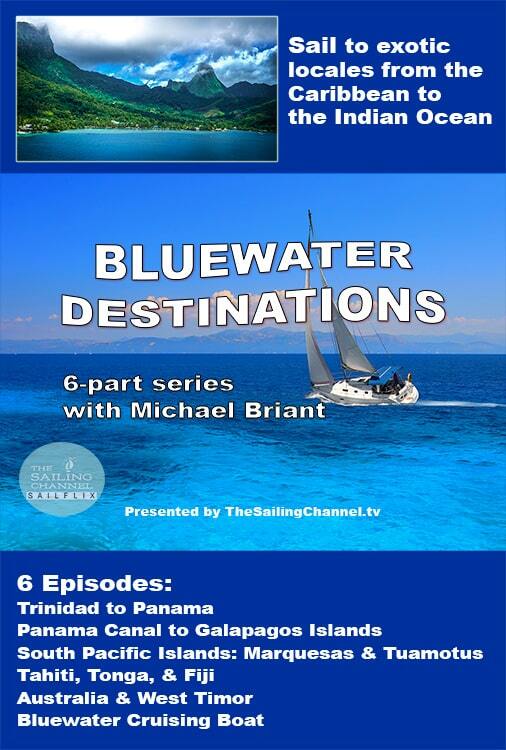 This 6-part series takes you to exotic bluewater cruising destinations from the Caribbean to Asia. Begin your journey sailing from Trinidad to Panama, stopping at seldom visited locales in the southern Caribbean. Next, transit the Panama Canal into the Pacific and sail on to the remote Galapagos islands. Continue across the south Pacific to the Marquesas and Tuamotus. Then explore Tahiti, Bora Bora, and the Cook Islands of French Polynesia. Complete your south Pacific cruise by visiting Sydney, Australia then sail north along the east coast through the Great Barrier Reef and around the top of Australia to Darwin. Finally, make a tropical 500 miles passage to West Timor, gateway to Indonesia and the Indian Ocean. Born in 1942, Michael has worked extensively in British theaters, film and television. In the early 1960s, he directed six episodes of the sci-fi Dr. Who series. Throughout the 1970s and 80s, he continued his directing and producing career. In the 1990s, Michael set sail in his own yacht, Bambola, and with a camera in one hand and a sextant in the other proceeded to make a circumnavigation in between directing assignments. From the footage he shot during the voyage, he developed this very popular series. 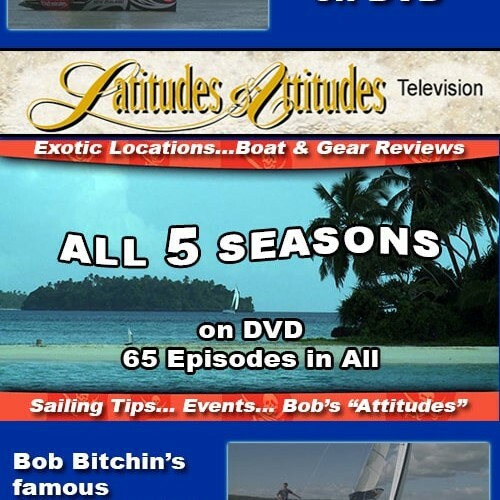 Buy or rent individual episodes on Vimeo Sailflix using the descriptions below. Ep. 1: Trinidad to Panama - 25 MIN. Michael takes you on a voyage from Trinidad to Panama exploring the southern parts of the Caribbean that are seldom visited and islands that may only be reached by boat. Discover the fishermen islands of Los Testigos and visit Tortuga, Los Roques and the lonely Aves, which are almost never visited by tourists and seldom by cruising yachts. Take a side trip upriver to Angel Falls in Venezuela. Sail to the Netherlands Antilles: the famous ABC Islands of Aruba, Bonaire, Curaco. Then make the trade-winds passage to Colon in Panama where cruising boats gather for the Transit of the Panama Canal. Ep. 2: Panama Canal to the Galapagos Islands - 25 MIN. A must for anyone intending to transit the Panama Canal. All three methods of locking are experienced – side wall, alongside, and center chamber, along with the permitted anchorage’s in the Galapagos Islands. Ep. 3: South Pacific Islands - Marquesas & Tuamotus - 25 MIN. A film by British Sailor and circumnavigator, Michael Briant. After crossing the south Pacific from the Galapagos Islands, join British sailor and circumnavigator, Michael Briant as he visits two exotic Polynesian island chains: the Marquesas and the Tuamotus. Make your first landfall on Fatu-Hiva in the Marquesas, then explore Tahuata and Hiva-Oa. Visit the grave of French artist, Paul Gauguin. Take a tour with a local chief to archeological sites and learn about Polynesian history. Then sail on to the rarely visited island of Ua-Poa with its soaring rock spires and dramatic mountain waterfall. Next sail north to Nuku-Hiva, the most sophisticated and modern of all the Marquesas Islands, and the chain’s cultural and administrative center. The island still retains a laid back island lifestyle with many beautiful anchorages, and includes a wealth of ancient stone carvings and ruins. Herman Melville choose a village on Nuku-Hiva, where he jumped ship in 1842, as the setting for his first novel, Typee. Finally sail north to the Tuamotus with their 78 atolls, many low-lying with dangerous with tricky channel entrances. A less fertile chain, the Tuamotus have less population. On Rangiroa, which hosts some exclusive and expensive vacation spots, get a close up look at the lucrative black pearl industry. Ep. 4: Tahiti, Tonga, Fiji - 25 MIN. British sailor and circumnavigator, Michael Briant explores more South Pacific Islands: Tahiti and the Society Islands, a very special island in the Cook chain, the island kingdom of Tonga, and the island nation of Fiji. On arriving in Tahiti, anchor behind the reef and explore this legendary, vibrant, very French capital of the Society Islands. Next, sail to the nearby, beautiful island of Moorea. Then stop at Bora-Bora before sailing onto the very special and unique Cook Island of Suwarrow – possibly the most beautiful in the world. Finally, discover the popular cruising area, towns and villages of Tonga before experiencing the culture shock, and hustle and bustle of Fiji. Ep. 5: Australia and West Timor - 25 MIN. Join British sailor and circumnavigator, Michael Briant as he sails into Sydney harbour, probably the nicest large city south of the equator, and full of life and fun. Then, cruise northwards along Australia’s challenging east coast. Escape tragedy in a gale while watching other cruising sailboats wreck on a reef and their crews rescued by helicopter. Continue your northward cruise through the interesting and beautiful islands of the Great Barrier Reef and on to Darwin, an excellent last stop for cruising boats heading out to Indonesia. Finally, enjoy a calm and smooth passage to West Timor accompanied by dolphins and light winds. On arrival, experience a real culture shock as you explore street markets and villages that have not changed for a thousand years. Ep 6.: Bluewater Cruising Boat - 40 min. Join British Sailor and circumnavigator, Michael Briant, in the Caribbean aboard his bluewater cruising sailboat, Bambola, a 1980 Moody 36 center cockpit sloop. Michael begins with a brief tour of some of his favorite Caribbean destinations: Rodney Bay, St. Lucia; Luperon, Dominican Republic; English Harbour on the south coast of Antigua; the mist covered mountains of Martinique. Michael then turns to the question: how difficult is it to do bluewater cruising? His answer is straightforward: anyone with a bit of experience and well constructed, heavy boat cam do it. He takes us on a tour of Bambola and shows us the on-deck modifications he’s made for safer bluewater voyages. Next he introduces us to an Austrian couple who have been cruising for six years aboard their catamaran, Jolly Swagman. They’ve sailed from the Baltic, through the Mediterranean, then across the Atlantic to the Caribbean. We tour their vessel and see how they’ve arranged and modified her over the years. Finally, we return to Bambola. Michael notes that most bluewater cruisers spend 80 percent of their time on anchor and you want your vessel configured to make life as convenient, comfortable and safe as you can. He takes us below for a tour of his cabins and the equipment he’s installed for comfortable and safe cruising – especially single sideband radio that connect cruisers around the globe. This leads to a discussion of weather – one of the most important concerns for cruisers. He introduces us to two prominent weather forecasters and routers who many cruisers rely on though single sideband radio contact. 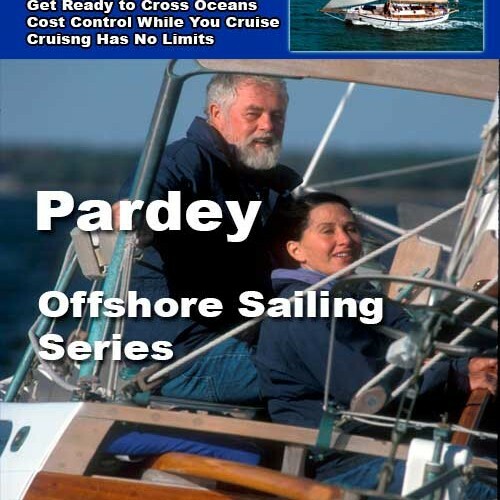 Michael concludes his bluewater sailing discussion with the cost of cruising. He gives some weekly cost estimates from his own experience and that of fellow cruisers. A very information packed 40 minutes for anyone considering heading out there. Michael concludes his bluewater sailing discussion with the cost of cruising. He gives some weekly cost estimates from his own experience and that of fellow cruisers. A very information packed 40 minutes for anyone considering heading out there. 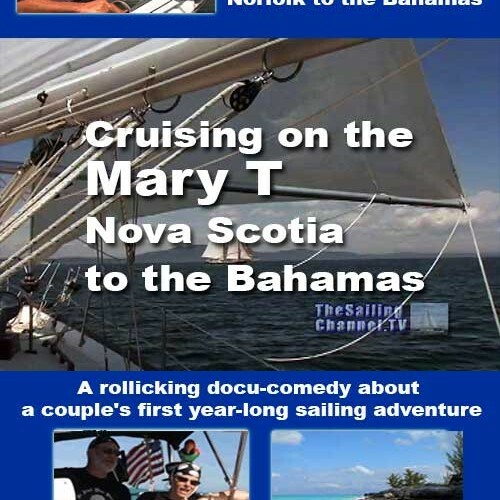 Buy or rent the Full Series on Vimeo Sailflix using the episode trailers below.